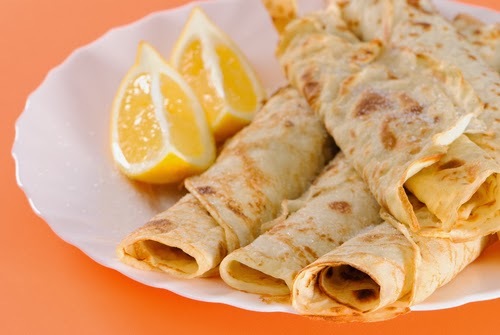 Today is Shrove Tuesday - or Pancake day in the UK. I remember us having pancakes at home when I was a kid every Shrove Tuesday. The idea about Shrove Tuesday and pancakes was to use up perishables like eggs and milk before lent began - a time of fasting. My mum would make pancakes and put lemon juice and sugar on them. It was always fun to watch her - or try myself, to flip them. Then we had the Dad making pancakes day one time…can't remember if that was Shrove Tuesday or another day, but sadly, he mistakenly used salt instead of the sugar :-( Poor Dad. He was so annoyed with himself. Lovely wafer thin pancakes dredged in salt and lemon!!! I love pancakes - but in the US pancakes aren't pancakes! Here you have to talk about crepes if you are meaning pancakes. In the US, pancakes are small and thick and you don't put anything inside them because you can't fold them so there is no inside! With this in mind, you may be surprised to see an American pancake recipe here, instead of a crepe! But it all started with a banana. 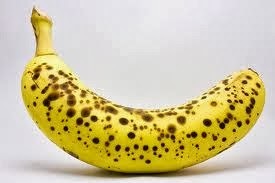 We had this banana that just looked so pretty. It's little brown spots were just perfect. I normally like more of an unripe banana but this one caught my eye and just looked so attractive that I told my hubby I would have it for breakfast the next day and he could start on the new less ripe ones. And so I woke up to my pretty banana and decided to make banana pancakes! No flour. No eggs or milk getting used up either…!! Process the cashews in a food processor. (If you want smooth pancakes, process until well ground. I actually like the texture so I just pulsed it a few times.) Add the remaining ingredients and process to combine. As you will see from the photos, I cooked my pancakes on the simmering plate of the Aga (my cooker) on a non-stick sheet so I didn't need any oil. If you don't have an Aga - you'll need a little coconut oil in a frying pan and then add the batter…cook for a couple of minutes and then flip and continue cooking. Yes - very vague directions but you've probably cooked more American pancakes than I have!!! They are sweet from the banana so I didn't drizzle anything on them and added nothing to them. They were just yummy banana pancakes! Perfect for pancake day :-D They aren't as firm as American pancakes made with flour but I think you'll like their taste. Vegan, gluten free, no added oil for us Aga owners, no added sugar, grain free, Paleo,………. AKA yummy squidgy banana pancakes!